Watch the highlight video from the conference. You may view the entire program in English or French on our YouTube channel. With over 2000 gay couples and singles worldwide, including 700 in Europe, the nonprofit organization Men Having Babies (MHB) is dedicated to easing the path to surrogacy parenting for its members. For several years MHB has been providing unbiased guidance and financial assistance to prospective parents in the USA, the UK and Israel. On May 2-3, 2015, the organization held its first conference in continental Europe, in collaboration with the LGBT parenting organizations "Meer dan Gewenst" from the Netherlands and "Gay Surrogacy UK”. 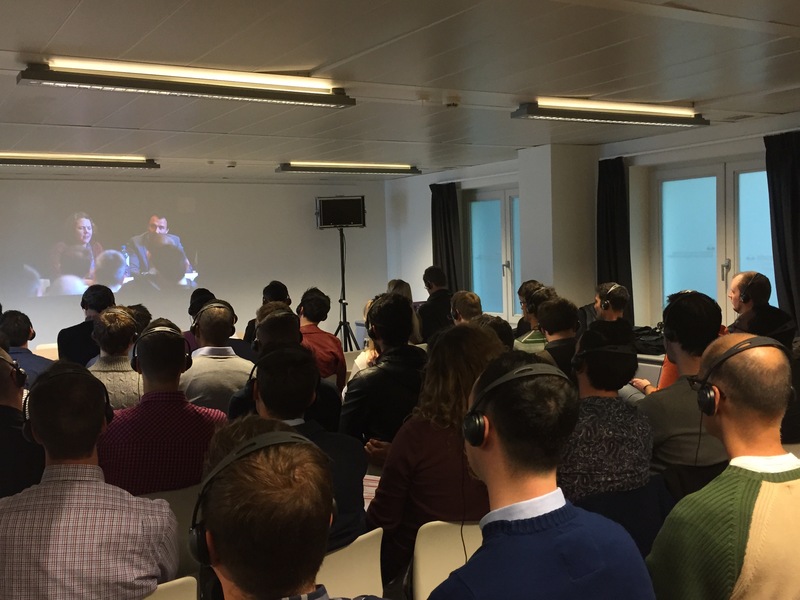 The “Brussels Conference on Parenting Options for European Gay Men” attracted more than 200 prospective gay dads from 10 countries, well above original estimates. "We were overwhelmed and moved by the large attendance and intense desire for parenting expressed by men who came from not just neighboring France and the Netherlands, but also from as far as Ireland, Portugal and Bulgaria,” said Ron Poole-Dayan, MHB’s executive director. The high demand forced the organizers to add an overflow room where dozens of attendees watched the presentations via live video feed. To help prospective parents navigate the precarious legal landscape vis-à-vis gestational surrogacy, the conference offered country-specific panels with leading European legal experts. To try to understand the unique attitudes on surrogacy in the continent, a round table of legal experts, social scientists, and community activists discussed “Legal and societal challenges for gay fatherhood across Europe, and the road ahead”. Their analysis pointed to a unique combination of lingering homophobia, general discomfort around assisted reproduction, concerns about possible exploitation of poor surrogates, and a mistrust of the perceived American commercial culture. The conference's resource fair included more than twenty clinics, agencies and community organizations that help gay men through the process of either adoption or surrogacy in the USA and Canada. Much of the misinformation revolved around the inclusion of service providers at the conference's resource fair. “The fact that we have to pay for professional services on our path to parenthood does not mean that we are 'buying babies’, just as using a dating service does not imply that one ‘bought’ their husband or wife,” said Poole-Dayan in an interview to Belgian public radio. “We are not legislators, so the most we can do is encourage transparency, and empower prospective parents, surrogates and practitioners to make informed decisions." 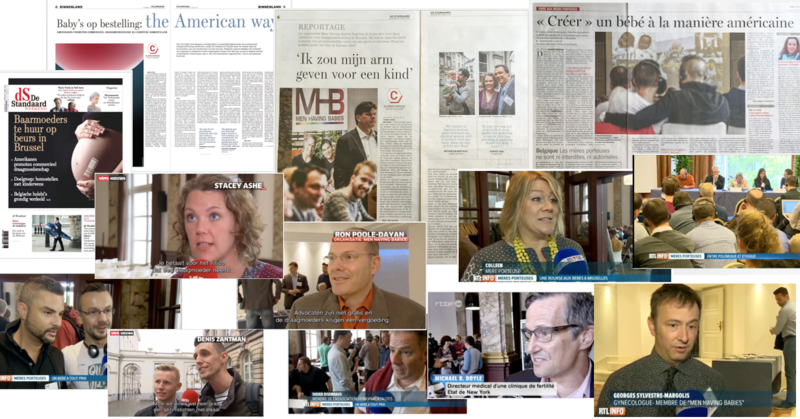 Large number of TV, radio and news journalists featured interviews with MHB board members, surrogates, European parents and conference attendees. While the media coverage before the conference included some surrogacy critics, by Monday the tone changed and the prominent newspaper 'De Standaard' led with the headline “I would give an arm for a child” ("Ik zou mijn arm geven voor een kind"), highlighting the strong yearning of European gay men for parenting. In a reception for International Family Equality Day, a clown helped entertain children who came with their gay dads from Germany, the Netherlands, Belgium and France. Conference organizers in the USA and Europe hope to continue to build on the progress achieved at the conference. To that end, a collaboration meeting took place with representatives and activists from the Netherlands, the UK, Belgium, France, Portugal, Ireland, and Switzerland. They resolved to work on the expansion of the Gay Parenting Assistance Program (GPAP) to more European countries, the formulation of ethical standards for surrogacy, and developing resources and tools to improve the visibility, awareness and acceptance of gay headed families formed through surrogacy. "It was amazing to see so many guys from Europe dreaming of a family, and it’s great that we can help them in this process,” said Marc Faber from Meer dan Gewenst. "However, based on what heard form some journalists and politicians, there is a lot work to do in Europe. I hope that together we can make much progress, and I think that the Netherlands can help lead this effort." Currently only residents of the USA, Canada, the UK, and Israel have full access to GPAP’s benefits that include over a million dollars worth of cash grants, discounts and free services for surrogacy and adoption in the USA. Arrangements are now expected to be made for these benefits to also be available to Belgians, Dutch, French and possibly residents of additional countries. GPAP is made possible thanks to support from MHB's loyal partners, including the conference's Platinum Sponsor, Worldwide Surrogacy Specialists. “We were excited to speak and meet with so many wonderful future parents and professionals from all over the world,” said Jennifer McArthur who represented Worldwide Surrogacy at the conference.